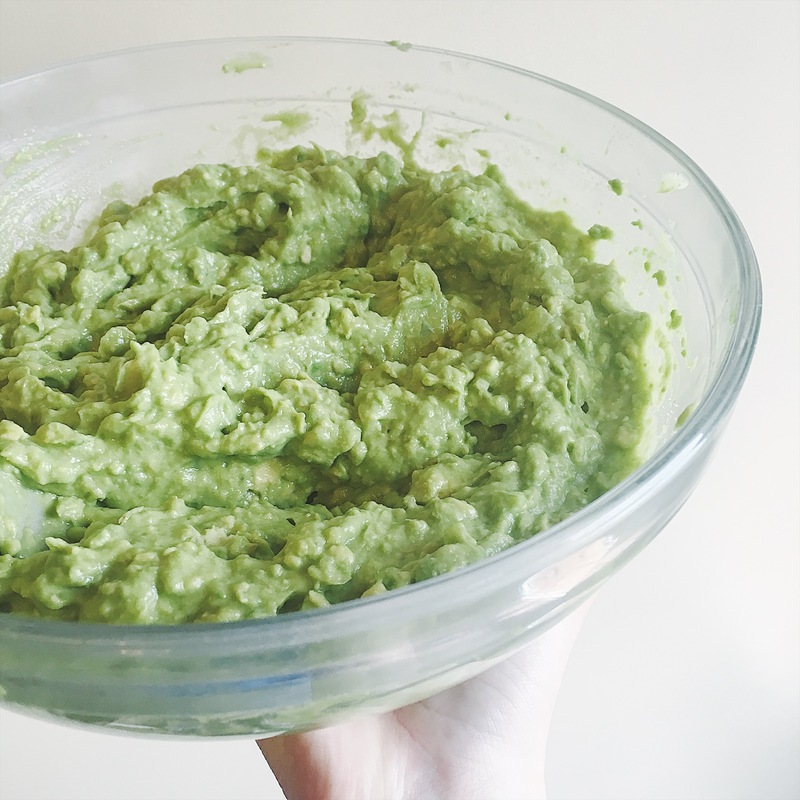 One of our go-to recipes around here is homemade guacamole! There’s nothing like a fresh bowl of guac set out on the table to accompany a taco supper…or even if it’s just plain set out for people to enjoy as an afternoon snack! My immediate family has been making this guacamole recipe for many years now. We’ve taken suggestions from others and tweaked it over time until it has been just right. 🙂 I love it as a snack, but it is also amazing to have alongside or on your tacos! When we have taco night with Bjorn’s family, they always put me on guacamole duty – I’m honored that they like this recipe so much! 1 // Cut avocados in half and remove the pits. Scoop them out and place in a medium bowl. If you’d like, start mashing the avocado now with a fork. 2 // Add the 1/3 cup diced onion to the bowl, as well as the lime juice (if you’re doing fresh, I’d just cut 1 lime in half and squeeze one of the halves into the bowl, airing on the side of NOT too much lime juice). Toss in the minced garlic and a good couple dashes of sea salt. 3 // Using a fork, mash the avocados and other ingredients until everything is thoroughly combined. You can, of course, determine how chunky you want it! 4 // Go ahead and try it with a tortilla chip! I always have someone taste test it for me. 🙂 Troubleshooting: If it tastes too limey to you, try an extra dash of salt. Regarding onions, our family likes to go heavier on the onions, but start out with the 1/3 cup and if your guac needs extra texture, it likely needs another tiny handful of diced onion. If your guac seems bland, I’d squeeze a tiny bit of extra lime juice in and then experiment with another dash of salt. Every family develops their own preferences, but the above recipe is what I most often do off the top of my head. 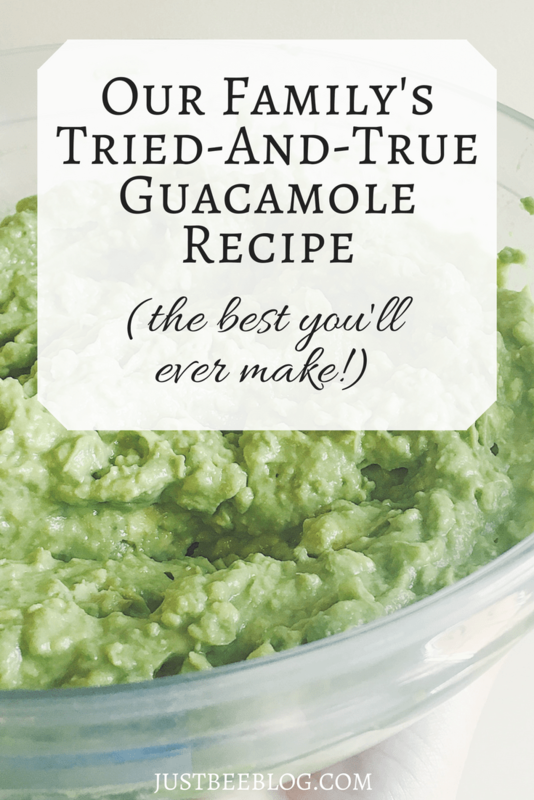 * Makes enough guac for a family of 5 or 6 to scoop out for tacos, plus some extra snacking! Serve with tortilla chips. Storage: I don’t typically like to store guacamole very long because it turns brown (plus it’s usually gone almost immediately, haha!) but if you must store it, keep it in its bowl in the fridge with plastic wrap pressed tightly against the top of the guac itself. You don’t want air to touch the guacamole because that’s what turns it brown! Do you have a go-to recipe in your household that you’ve made so many times you now have it memorized? Please share it below! !